The Qeggs reunion on Sunday 20th September proved to be a memorable and happy occasion. 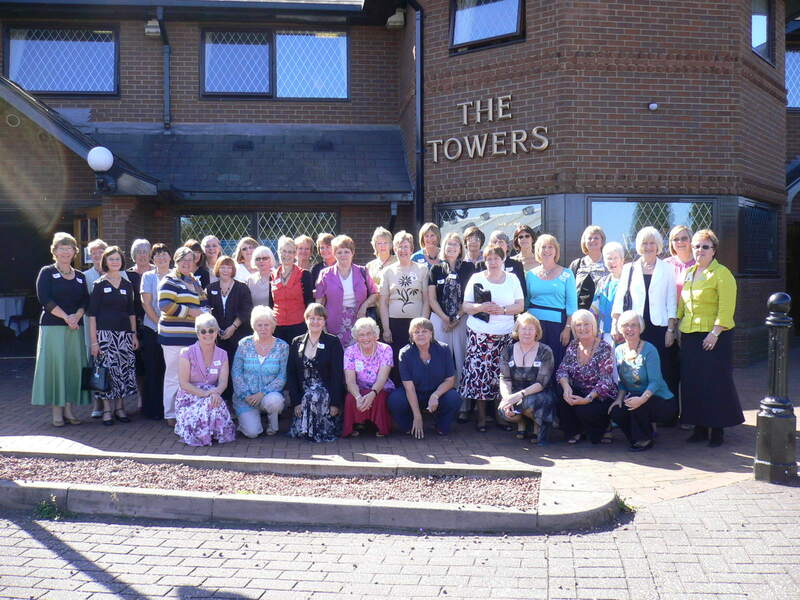 We were blessed with good weather and the sun shone on us all, as the group photos show. 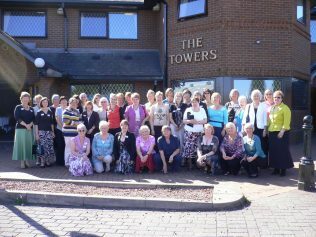 We congregated at the Towers from 12pm on. Old Girls were met at the door with name and house badges to wear, and many had brought school memorabilia to put on the display table. These included badges, scarves, hockey boots, girdles and colours, reports and exercise books. There were plenty of photos too. People had travelled a considerable distance to be there, coming from Essex, Norfolk, Sussex, Bristol, Croydon and even Luxembourg to be with us. There was plenty to see, with posters of how we were 50 years ago, the fashions, food , entertainment etc. On her laptop, Gill Hughes had set up a rolling programme of school photos loaned and emailed to us by many of those present. There were also the two long school photos of 1st and 5th years that people could write their names on if they could find themselves. The “do you remember” board had some nice touches from 50 years ago, and there was a card to sign for Miss Batty, who is still alive and has a formidable memory. A topic of interest was the display of cups and trophies, some bearing the names of people present, which we had obtained from the bank vaults where they had been since the school closed. The Standing Salt was much admired. Vivienne Packard gave a speech of welcome, outlining how the idea of a reunion had grown and become a detective search for missing girls. Word of mouth, the internet, Friends Reunited and much telephoning and emailing had proved successful, and thanks were due to all who had helped. A delicious buffet lunch was then served, and chatting continued over the meal. Diane Bradley read out messages and news from Absent Friends, which was later pinned up for people to see. The 50 years-on school cake was cut by Lesley Bullock, whose birthday it was, and toasts were drunk with wine brought from Luxembourg by Barbara Hall. We then went outside into the sunshine for a group photo. A quiz sheet prepared by Rose Chappell and Hilary Parsons was doing the rounds, with people organising themselves into teams. Before the answers were read out, an entertainment in the form of the class poem “The Tale of Nancy Peggs “ was performed by Rose and Barbara Richardson. Perry Hull then showed the video of Joyce Grenfell’s “school reunion”, which wasn’t a bit like ours! The quiz answers were then given, with Maralyn Shelton winning the tie-breaker and a prize of wine and chocs. Barbara Hall , Jayne Drinkwater and Rosalyn Barrett then led us in singing the school song, song of the houses and the school hymn. We ended with Auld Lang Syne and “till the next time”. I left QEGGS in July 1970 and have many happy memories of my years there. As said by many others, we were all scared of Miss Batty – I clearly remember being summoned to see her, and told to wait under the clock in the round hall! – how my knees were knocking! Marvellous to find this site. Believe the formal old scholars’ association has been disbanded. Pity. I was at QUEGGS 1941-1946, then I went to West Bridgford Grammar School.Would like to hear from old scholars from about that time, or later! Contemporaries were Margaret Starmer, Pauline Bates, Margaret Douglas, Margaret Baldock, Pamela Durrant. Doris Smith was Head Girl towards the end of my time, and of course the formidable D.C.Johnson. Remember most of the staff during those years very clearly. We were all so lucky to go to such a good school, with such excellent teaching staff. I’ve lived in Australia since 1950, but visit u.k. almost annually. Is anyone out there? Would love to hear from them. I visited the old school in the late ‘nineties; then visited the Chesterfield Road campus when the school had moved to what used to be the Boys” Grammar School. The old school was “off bounds” when I last visited U.K., and I think was due for redevelopment, sadly. Hope to hear from someone…. My goodness – lovely to find this site! I was at QEGGS in the early 70’s. Just watched a programme on Delphi on TV and was remembering our class visiting it with Mr. Maw on our Greek school trip. We certainly had some great teachers. I was a pupil at QEGGS from 1972-1979 under Miss Batty. No matter which year one attended this marvellous school the feeling of belonging sings out across the years. It was a geat school, in statuesque surroundings and the grandeur of the library has remained with me as has the enduring memory of its unique teachers and great classmates. I was so excited to find news of my old school on the internet. I am now 85 – I attended Queen Elizabeth’s from 1936 to 1940,when I left for Canada and have been living in the U.S. for many years. I was a “Rose”. I still remember most of my schoolmistresses names! I have such fond memories of my time there.